The implication of a report written for the US Congress is that the United States is a state sponsor of terrorism in Syria. At the same time, the report challenges widely held beliefs about the conflict, including the idea that the opposition has grass-roots support and that the conflict is a sectarian war between Syrian president Bashar al-Assad’s Alawite sect and the majority Sunnis. Written in October 2015, the report was prepared by the Congressional Research Service, an arm of the United States Library of Congress. The Congressional Research Service provides policy and legal analysis to committees and members of the US House and Senate. 1. The Syrian conflict is between Islamists and secularists, not Sunnis and Alawites. Media reports often emphasize the dominant Sunni character of the rebels who have taken up arms against the Syrian government, while depicting the Syrian government as Alawite-led. What is almost invariably overlooked is that the largest Sunni fighting force in Syria is the country’s army. Yes, the rebels are predominantly Sunni, but so too are the Syrian soldiers they’re fighting. As Congress’s researchers point out, “most rank and file military personnel have been drawn from the majority Sunni Arab population and other (non-Alawite) minority groups” (p. 7). Also: “Sunni conscripts continue to fight for Assad” (p. 12). Rather than being a battle between two different sects, the conflict is a struggle, on the one hand, between Sunni fundamentalists who want to impose their version of Islam on Syrian politics and society, and on the other hand, Syrians, including Sunnis, who embrace a vision of a secular, non-sectarian government. 2. The Syrian Opposition Coalition is dominated by Islamists and is allied with foreign enemies of Syria. According to the report, the Syrian National Council (whose largest member is the Syrian Muslim Brotherhood) is the “largest constituent group” of the Syrian Opposition Coalition (SOC). The SOC is based “in Turkey and considered to be close to foreign opponents of Assad.” (p. 14) The Muslim Brotherhood seeks to base political rule on the Quran, which it sees as divinely inspired, rather than on a secular constitution. 3. “Political opposition coalitions appear to lack…grass roots support” (p. 27). This is consistent with the findings of a public opinion poll taken last summer by a research firm that is working with the US and British governments. That poll found that Assad has more support than the forces arrayed against him. 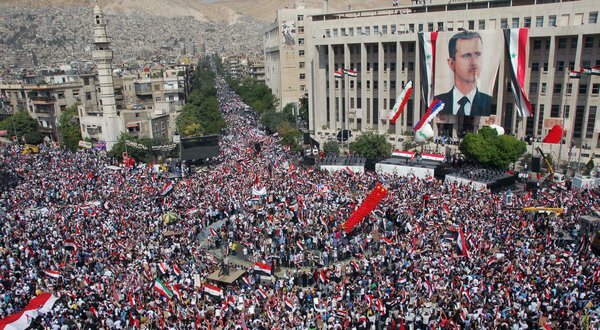 Syrians rally for Assad, October, 2011. According to the poll, only six percent believed that the “genuine” rebels represented their interests and aspirations, while the ‘National Coalition/transitional government,” a reference to the SOC, drew even less support, at only three percent. 4. 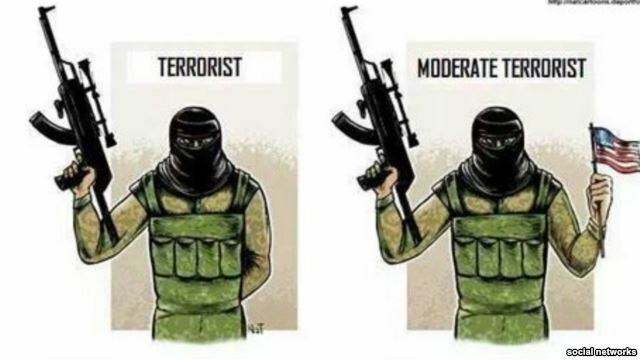 A moderate opposition doesn’t exist. The United States is trying to build one to act as its partner. The report refers to US efforts to create partners in Syria, a euphemism for puppets who can be relied upon to promote US interests. “Secretary of Defense Carter described the ‘best’ scenario for the Syrian people as one that would entail an agreed or managed removal of Assad and the coalescence of opposition forces with elements of the remaining Syrian state apparatus as U.S. partners ….” (emphasis added, pp. 15-16). Also: The Pentagon “sought to…groom and support reliable leaders to serve as U.S partners…” (emphasis added, p. 23). “On June 18, Secretary of Defense Carter said, ‘…the best way for the Syrian people for this to go would be for him to remove himself from the scene and there to be created, difficult as it will be, a new government of Syria based on the moderate opposition that we have been trying to build…” (emphasis added, footnote, p. 16). 5. The United States is arming sectarian terrorists indirectly and possibly directly and covertly. “Then Secretary of Defense Chuck Hagel said in a September 2013 hearing before the Senate Foreign Relations Committee that the Administration was taking steps to provide arms to some Syrian rebels under covert action authorities” (p. 23). “Secretary Hagel said, ‘it was June of this year that the president made the decision to support lethal assistance to the opposition….we, the Department of Defense, have not been involved in this. This is, as you know, a covert action’” (footnote, p.23). If the United States was prepared to overtly arm some rebel groups, why is it covertly arming others? A not unreasonable hypothesis is that it is arming some rebel groups covertly because they have been designated as terrorist organizations. To be sure, a number of press reports have revealed that rebels who have received training and arms from the United States are operating with terrorist groups in Syria. According to the Wall Street Journal, “insurgents who have been trained covertly by the Central Intelligence Agency…are enmeshed with or fighting alongside more hard-line Islamist groups, including the Nusra Front, Al Qaeda’s Syria affiliate” . Another report from the same newspaper notes that “al-Nusra has fought alongside rebel units which the U.S. and its regional allies have backed” . A third report refers to collaboration between “CIA-backed Free Syrian army factions and extremist elements such as Nusra Front and Ahrar al Sham” . Let’s be clear. Anyone who is enmeshed with and fighting alongside Al-Qaeda is a terrorist. According to Congress’s researchers, weapons the US furnished to selected groups have made their way to jihadists. “Some Syrian opposition groups that have received U.S. equipment and weaponry to date have surrendered or lost these items to other groups, including to extremist groups such as Jabhat al-Nusra” (p. 23). When you consider that, as The Washington Post reported, “the CIA has trained and equipped nearly 10,000 fighters sent into Syria over the past several years”  and that, at best, there are 700, and more likely only 70 “moderate” rebels in Syria , then the bulk of the large rebel force the CIA has trained and equipped is very likely made up of Islamist extremists. Concealing this shameful reality from the US public is probably the principal reason the program is covert. 6. Washington wants to contain ISIS, but not eliminate it, in order to maintain military pressure on the Syrian government. A tepid approach to fighting ISIS in Syria would fit with US president Barack Obama’s stated goal of degrading the Al-Qaeda offspring organization. Destroying it may be an ultimate goal, to be achieved after ISIS has served the purpose of weakening the Syrian government. But for now, the United States appears to be willing to allow ISIS to continue to make gains in Syria. The Congressional Research Service report concurs with this view: It concludes that “U.S. officials may be concerned that a more aggressive campaign against the Islamic State may take military pressure off the” Syrian government (p. 19). By contrast, Moscow has pursued a more vigorous war against ISIS, and for an obvious reason. Unlike Washington, it seeks to prop up its Syrian ally, not give ISIS room to weaken it. It should be additionally noted that Russia’s military operations in Syria are legal, carried out with the permission of the Syrian government. By contrast, the US coalition has brazenly flouted international law to enter Syrian airspace without Damascus’s assent. It has, in effect, undertaken an illegal invasion and committed a crime of aggression, compounded by its training and arming of terrorists. •	Keeping ISIS alive as a tool to sustain military pressure on Damascus. •	Arming jihadist groups indirectly and (we can assume) directly (albeit covertly) to pressure Assad. •	Seeking to create a moderate opposition that will act as a US partner. •	Trying to co-opt parts of the existing Syrian state to take a partnership role in governing a post-Assad Syria. The implication of points 1 and 2 is that the United States—as the trainer of, and supplier of arms, to rebels who are enmeshed with and fighting alongside Al-Qaeda in Syria, and in keeping ISIS alive, in order to use these terrorist organizations to achieve its political goal of installing a US-partner government in Syria—is a state sponsor of terrorism. 4. Philip Shishkin, “U.S. weighs talks with Russia on military activity in Syria,” The Wall Street Journal, September 16, 2015. 5. Stuart Rollo,“Turkey’s dangerous game in Syria,” The Wall Street Journal, December 28, 2015. 6. Anne Barnard and Michael R. Gordon, “Goals diverge and perils remain as U.S. and Turkey take on ISIS,” The New York Times, July 27, 2015. 7. Farnaz Fassihi, “U.N. Security Council unanimously votes to adopt France’s counterterrorism resolution,” The Wall Street Journal, November 20, 2015. 8. Sam Dagher, “Syria’s Bashar al-Assad Tries to Force the West to Choose Between Regime, Islamic State,” The Wall Street Journal, October 9, 2015. 9. Greg Miller and Karen DeYoung, “Secret CIA effort in Syria faces large funding cut,” The Washington Post, June 12, 2015. 10. Robert Fisk, “Is David Cameron planning to include al-Qaeda’s Jabhat al-Nusra in his group of 70,000 moderates?”, The Independent, December 1, 2015. 11. Thomas Walkom, “Journalist Robert Fisk explains why Canada should abandon ISIS war,” The Toronto Star, September 25, 2015. 12. Patrick Cockburn, “Russia in Syria: Air strikes pose twin threat to Turkey by keeping Assad in power and strengthening Kurdish threat,” The Independent, October 28, 2015. 13. Raja Abdulrahim, “Islamic State advances further into Syria’s Aleppo province,” The Wall Street Journal, June 1, 2015.